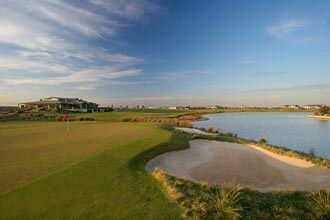 Sanctuary Lakes GC is a Greg Norman designed course. It is a great test for any golfer. This links style course is very much open to changing wind conditions and also has a number of holes where water is a primary obstacle. 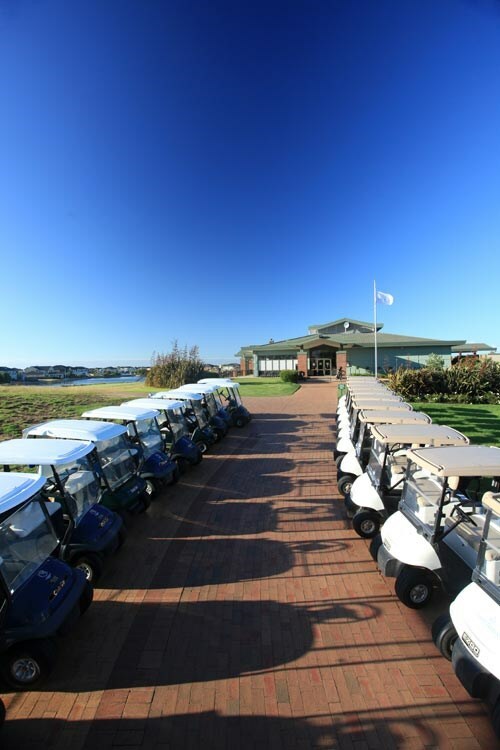 Greg Norman's design project at Sanctuary Lakes was a challenging one. Take a flat, boring piece of almost swamp land and turn it into a world class golf course. The result? 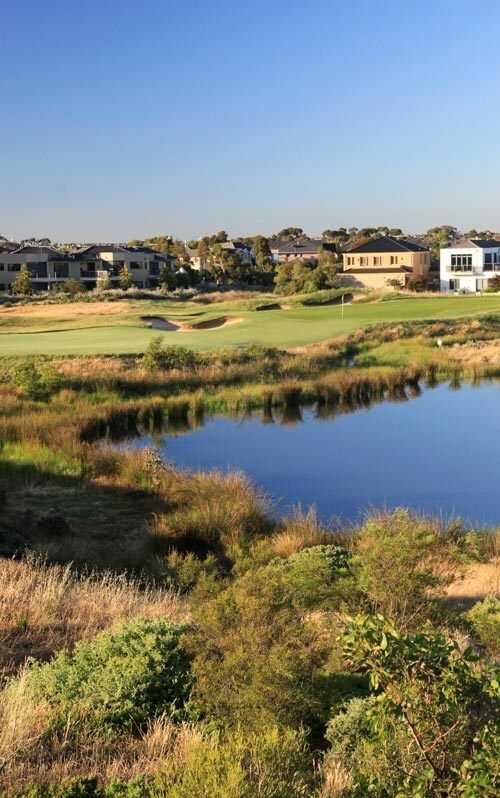 Well, Norman has succeeded and the product that is Sanctuary Lakes is a refreshing addition to the Melbourne golfing scene. 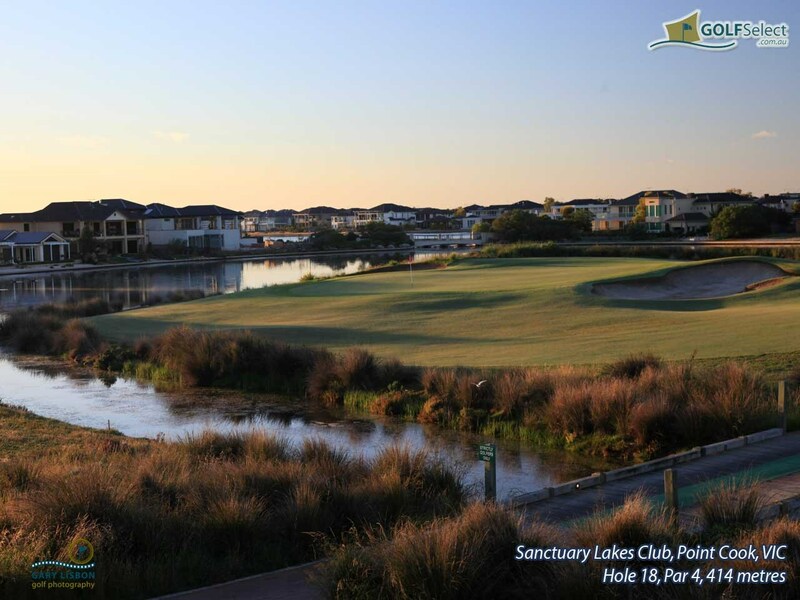 As its name suggests, Sanctuary Lakes has a number of holes where water is a primary obstacle. Negotiate these holes successfully and you are faced with a combination of other holes that have their own challenges. 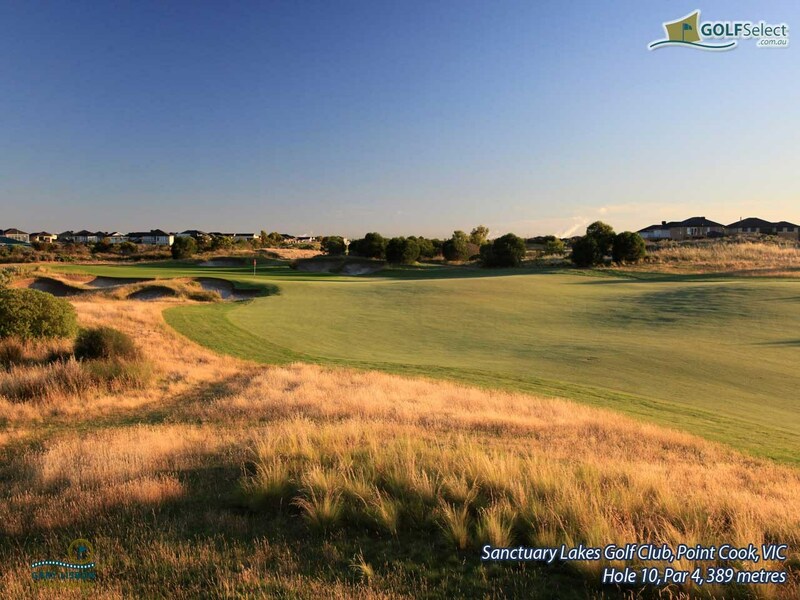 Wind is a constant factor at Sanctuary Lakes and if the golfer can add a punched 5 iron to their shot-making this will help combat the wind. 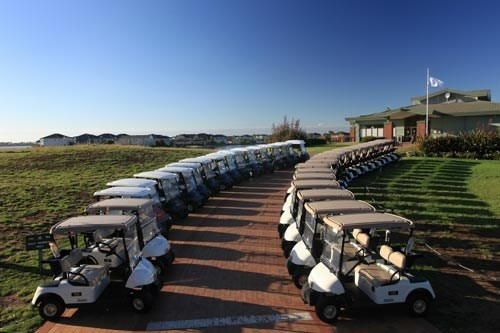 The course has many of the characteristics of the man who designed it. Dual British Open Champion Greg Norman has drawn on his knowledge of many of the Scottish and Irish courses he played during his career to create a testing golf course. Par 5 holes can be reachable in two given the correct wind conditions, bunkers swallow the approaches to many of the holes yet add character and challenge to holes and the putting surfaces are large and undulating in their topography. 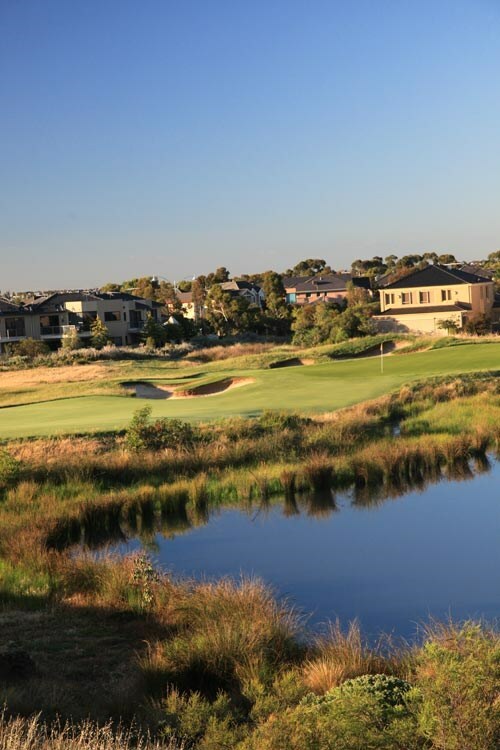 Sanctuary Lakes was built on a fairly desolate piece of land surrounded by environmentally sensitive areas and is as close to links style golf as you are ever going to get 20 minutes from the Central Business District of Melbourne. Unfortunately, we cannot locate the venue address on the map. From the back tee this 379 metre par four lays North and South and from the tee the idea will be to try and make the obvious landing area on the undulating fairway 230 metres out. With maybe only a six or seven iron shot left to reach the green, the player will need to be very wary of the expansive bunker guarding the right hand side of the green and the small yet strategically placed "pot" bunker on the left hand side. Also be aware that over the back, and the back right of the green slopes away severely. The danger here will be in club selection. The extensive bunkering around the left hand side of the green will give more than a few players cause for concern. Land in them and par will not be as easy as it may have seemed from the tee. Also, be aware that over the back of the green slopes away severely. Some players will tend to want to open their shoulders off this tee as the hole has a fairly wide fairway which although well undulated, does provide a generous landing area left of centre after a good drive from the tee. For anyone who slices the ball though, the small creek down the right hand side may prove to be more than a handful. With a fairly large green to aim at, a lofted iron shot to the putting surface may yet see a good score marked on the card. Over the back and the right hand side of the green slopes away severely. The 500 metre fourth can be aptly tagged as a driver?s hole. From the back tee the small lake and wetlands on the left will ensure that the player keeps to the right of the fairway, but not too right as the bunkering that has been placed to catch the errant drives may leave a reasonable score wanting. The well contoured green is protected by some excellent bunkering and from different angles on the fairway, the player will be faced by either a sea of sand or a good opening for a Scottish "bump and run" shot which on a links style course will not seem out of place. Over the back, left and right hand sides of the green slopes away severely. 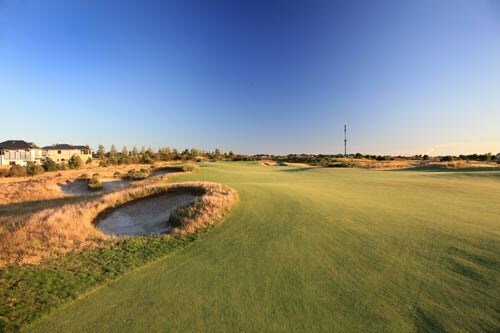 Although having the appearance from the tee of being a straight forward par four, its 393 metres plus the fairway undulations and the awesome array of fairway bunkering on the right hand side will give many a player cause for some concern. The fifth will be listed as one of the courses better par fours and providing that the landing area is reached from the tee and that the ball is kept away from the right hand side bunkering, it will still need a good medium iron shot to reach the green in regulation. The greenside bunkering is all to the left and most players facing the green for their shot in will not realise that anything left will be in real trouble. The water is the principal hazard on this par three. The shot to the well bunkered green will need a carry of 156 metres to make the cut surface. Like Augusta National's famous par threes that have water in front of them, this particular hole will be manicured in front of the green to the water level and this in itself will present a problem to many players who will tee off here. A ball just short may get a real dunking. A respite of sorts awaits the golfer on this 367 metre par four. This is a good driving hole and although a glimpse of water can be seen on the right hand side of the fairway from the tee, the required landing area will be just to the right of the fairway bunker. A mid iron to the green for the second shot for the average player will see a relatively easy par or better placed on the scorecard. 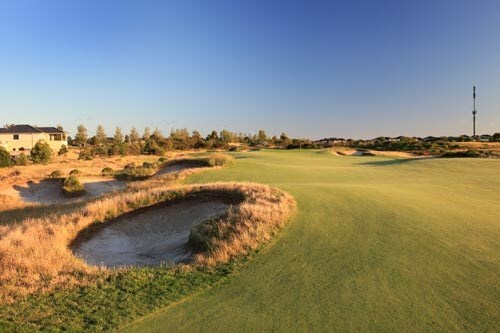 This 535 metre par five is a golf hole that will no doubt be regarded as Greg Norman?s signature hole on this course. A wall of bunkers face you as you stand on the tee to either drive over or to the left of. The second shot will need to be out to the right to keep away from the mound and its cavernous bunkers guarding the approach to the green and if placement is undertaken in this manner, a par may be the reward. Although it will give the impression of being a straight forward par 4, the wind on most occasions will be the governing factor on how the player will complete the front nine. Once again a reasonable landing area has been designed but the well bunkered green needs accuracy for the ball to arrive safely. Fairway bunkering on the right hand side will force the player slightly left of centre and with that occurring, the greenside traps will make the next shot a very cautious one. The 10th hole a par 4 of 389 metres has a landing area with some very interesting fairway bunkers protecting the right hand side of the fairway. The mounds behind these bunkers separate the hole from the practice fairway and despite having the appearance of being an easy hole, its looks can be deceiving. From the tee with the wind behind a long drive can be rewarding but played into a head wind, distance off the tee may not be too easy to come by. If the fairway bunkers do not capture the golf ball from the tee, those that guard the green may make a good score a real difficulty. 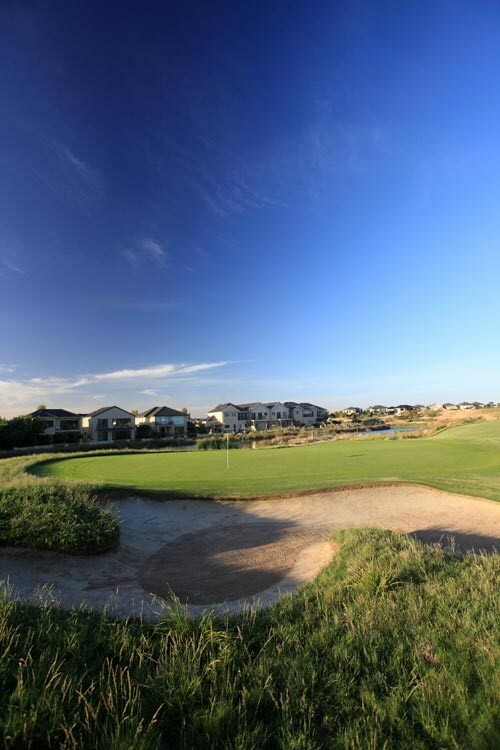 With its length of 169 metres from the back tee, the greenside bunkering will tend to have an intimidating effect, but as with any well laid out par three, that's the way that it should be. On most occasions a high ball to the green providing that club selection is right may bring rewards, but the bunkers surrounding the green need to be avoided to be able to score well here. With 517 metres in front of the player standing on the tee of this par five, the rolling fairways will give the impression that placement of the ball from the tee will be paramount and this is just so true. The hole takes a slight dogleg to the right from where a good drive will finish and then it may take two more excellent shotsto safely reach the green in regulation three. The undulations and mounds will have a direct role in what sort of a score occurs on this par five and this is one hole that is sure to yield many birdies and better when the course hosts a professional tournament. Just over the greenside bunker the fringe slopes towards the green. This hole with its tee in the most Easterly part of the course runs from East to West and the very slight veering to the left should be appropriate for those who play with a draw. The rather well shaped green has some pretty fierce bunkers alongside it and like many others on the course, landing in them will be cause for concern. The green has a couple of little putting surprises waiting and a good putting stroke will be of prime importance. The nest of bunkers on the left hand side will make caution on this hole a necessity. If the drive is successful, then accuracy with the second shot will be paramount as the expanse of sand that guards the right hand front of the green is guaranteed to swallow up any wayward golf balls. Leave anything short whether from the tee or in the iron to the green will find that the rewards will be hard to come by. The green is the deepest on the course and slopes slightly from front to back. This 315 metre par 4 is the shortest par four on the course. The right hand side of the fairway has four bunkers lined up and if that is where the drive finishes it will take some perfectly executed sand shots in order to make the green in the regulation two. But the danger will not finish there as like many of the 18 holes on the course that Greg Norman has designed the "traps" surrounding the green may also cause some discomfort if the approach shot does not find the putting surface. On this particular hole, club selection will replace length. 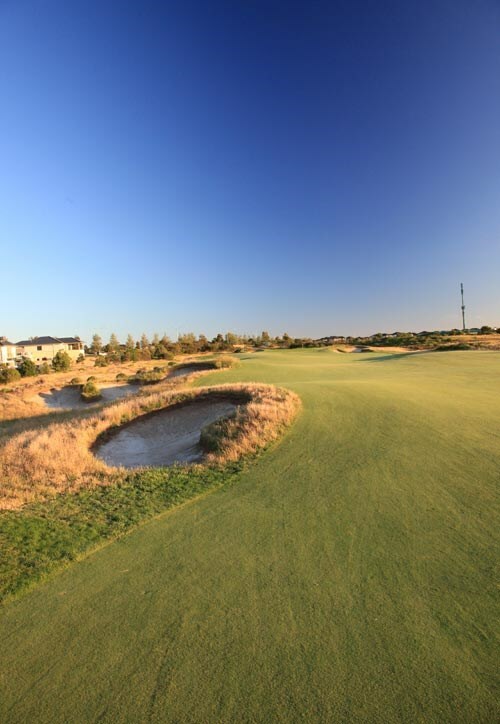 The length of the 16th is 523 metres and although it is not one of the longest par fives in Australian golf, it is one that golfers will talk about whenever they gather. From the tee, the undulations with deep fairway bunkers on each side of the landing area will set the scene for what is to come. The second shot will have to be taken with water down the left hand side possibly forcing a lay-up shot to be taken for safety's sake. The green is guarded by the lake and wetlands which should deter the player from going for the green in two, those who try to achieve this will need to be really able to strike a golf ball well. If this is achieved, the player can genuinely walk off with a real smile on their face for their achievement of a par or better. The water to the left of the this fairway will give those that draw the ball a great deal of concern as the water laps the entire left hand side of the hole, but for those that fade the ball, this 202 metre par 3 will be a searching test of golfing ability. The length of the bunker at the left front of the green accompanied with the water should force all shots to the right and it will be there that the well placed mounds will come into play. As the fairway and green run North and South, the wind will be a significant factor. This is a par four of 414 metres and its signature will be its island green, yet to be able to get there unscathed will take some excellent golf. After landing safely from the tee, the fairway which is devoid of bunkers will give the player the chance of playing a middle iron (down wind) to the well bunkered green completely surrounded by water. Into the wind a layup before the creek guarding the green may be necessary for damage control. The island is not entirely flat and the mounds to the right and at the back of the green will stop most balls from going too far and ending up wet.